Calakmul world heritage site Maya ruins and Biosfera reserve treated Yucatan Bill , me, and about 20 totally clueless tourists to a battle royale for dominance of a 12 member Howler Monkey pack. We had watched the pack resting and lounging-about in the distance about 2 hours earlier ~ the first howler monkeys in the wild Bill and I had ever seen ~ never expecting what was just over the horizon. A free-for-all pitched battle started right in front of the Big Pyramid (Estructura #2) – when a big strong #2 male challenged #1, for Leader of the Pack… in the treetops, right next to the bottom set of stairs in this foto. A wild battle raged for over 20 minutes … 4 big male howler monkeys thrashing and crashing around the top of the jungle canopy, jockeying for position, slashing at each other’s flanks with nasty canines , as the majority remainder of the troop of Howler spectators (6-8 others) ~ hooted, howled and roared – and watched for a winner. After 20 minutes of a pitched tree-top see-sawing battle, #1 – the Leader of the Pack managed to corner the Usurper (#2) onto a limb with no easy escape, as #3 and #4 – the Lieutenants solidly flanked the Usurper on both left and right. The Leader then pressed the assault up the middle – driving the Usurper further & further out onto the limb – on the tree you see next to the stairs, at the slight break in the trees – a gap that trapped the Usurper … as the Lieu’ies #’3 & #4 slashed at the Ursuper’s flanks – drawing serious blood… The Leader then took on the Usurper directly in savage full-frontal close-quarter fighting. After 25 minutes of wild fighting Usurper was cornered, his back to the gap, and saw that all was lost, haunches dripping with glistening blood …. as even juvenile males now moved to surround him – cutting off all escape – leaving him no option… but surrender… begging clemency from The Boss. The fotos document just the last 3-5 minutes of the battle – orchestrated almost 50 feet overhead – in a dense tree-top canopy – that obscured what was happening to all the other viewers – who simply imagined that it was “howling time” or that maybe the Howlers were just pissed-off over a nearby troop of spider monkeys feeding on favored sapote fruits…. Many people living here in Yucatan go an entire lifetime without even seeing or hearing a single howler. Yes: Howler monkeys were harmed during the filming of this event. and … I watched very very carefully to see if #2 left the group after backing-down – and nope – he was still with them at last viewing – so, I doubt that he was an outsider – trying to join or trying to simply come in and take over… ??? The troop then spread out to feed on sapote for the next 30 minutes, and then lounge around, rest, and recover…. Note that these fotos are the personal property of William Drennon, fully copyrighted, and are NOT permitted for use without Mr. Drennon’s prior approval. 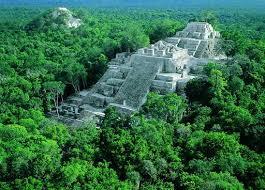 YucaLandia/Surviving Yucatan. ©Steven M. Fry – no copying permitted this time. Wow, I’m so envious. What an extraordinary ‘happening’ you experienced. Thanks for sharing. What tour group were you with? aka Bill, Steve, Josh, ‘n Sid. Oh, you mean the other “clueless tourists” just happened to be there too. You weren’t all together on a prepaid tour. Still an amazing experience. I’ve seen and heard howlers before but never saw much interaction….talk about serendipity! No tour for us, but there was one small tour of 2 Taiwanese girls, plus there were tourists there from Poland, San Diego, Italy, Mexico City, et al – all of us wandering around the site. Perspectives: Since the rowdy battle happened about 50 feet above us, in the dense leafy tree tops, moving between 4 different trees, viewers without binoculars or good knowledge of monkey troop behaviors could not understand what was happening. Bill and I are both professional scientists => trained observers. Without training and background context to recognize and realize what was going on, it’s really difficult for tourists or the one tour-guide to grasp what’s happening. I was also the only viewer who was scooting from place to place under the battle, finding successive open views through the brush, able to catch clear glimpses of the action – as the tourists stood in one spot, unmoving, as black shadows of big bodies made the branches shake vigorously. … Finally, Bill’s superb long telefoto lens and steady hands allowed him to zero-in and photograph things – confirming what I could only make educated-estimates over. 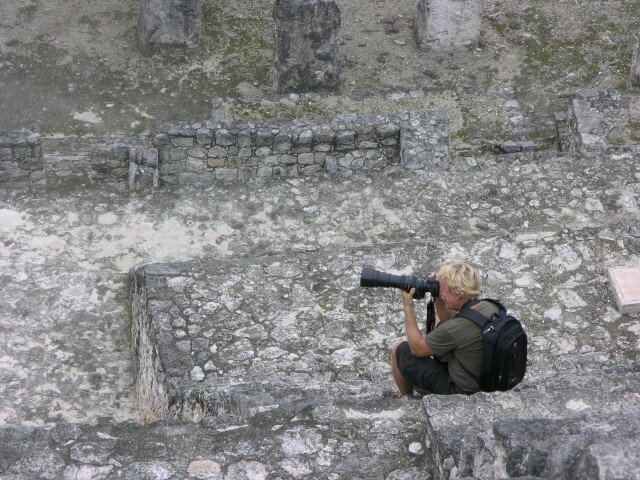 I was through Calakmul a half decade ago, saw a jaguar stalking a flock of turkeys on the way into the ruin. We had a run in with a group of rude monkeys over at the Guatemalan ruin called Aguateca, they were pelting my party with fruit and monkey crap. All in good fun of course, no blood was shed. Jaguar stalking turkeys is pretty special. Did you get any fotos? It was one of those driving down the road sightings. The turkeys were aware that the jaguar was sneaking down the road’s ditch and our stopping was enough to send them all into the bush. In all my ruin hunting, it is the only big cat I’ve seen.